I have never been one to make freezer meals at home because it stresses me out. Making sure that you have everything sliced, diced, shredded, cut, and prepped I always miss something no matter how prepared I think I am. And picking meals that include fresh ingredients and taste good – don’t get me started. Thankfully there’s a solution to this problem. Making the meals is easy, sessions can take up to 2 hours depending on what you have chosen to make. Instructions are clearly laid out for you to follow and everything is prepped for you. Alternatively, if you don’t have the time to come in and make the meals yourself Simply Supper can assemble the meals on your behalf for you to pick up and also have a Fresh-2-Go menu where you can pick up your meal in store for dinner that night. Pricing is actually pretty darn decent. Prices vary depending on how many people you are making the meals for and how many meals you have chosen to make. All pricing can be found here. For 12 meals assembled by me, for my family of 5 the total cost is $340 which equals out to $4.72/person per meal. It is cheaper than a family dinner out and offers me way more piece of mind because I know what’s in the food that I am eating. Simply Supper is located at #1, 2305 Rabbit Hill Road. View their monthly menu option, hours, and anything else here. 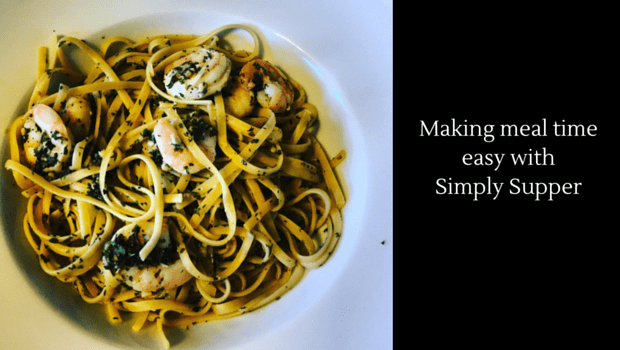 I have teamed up with Simply Supper to offer you the chance to win a $50 gift card to use towards trying out some of their delicious menu items. Enter via the widget below. Lots of delicious items for sure. I see in the June menu the Chipotle Maple Salmon Burger. Absolutely my mouth is watering! We love simply supper at our house. We would love to try the popcorn shrimp on Junes menu!